Deploying an Avere Edge Filer that uses SMB requires a small amount of Active Directory configuration. This configuration ensures continuous secure operation as the highly available Avere cluster is inserted into your environment. These instructions assume the customer is using NTFS security on their shares. If only POSIX mode bits are used, then much of this setup may be bypassed. In the pre-Avere environment, clients access shares directly on core filers. 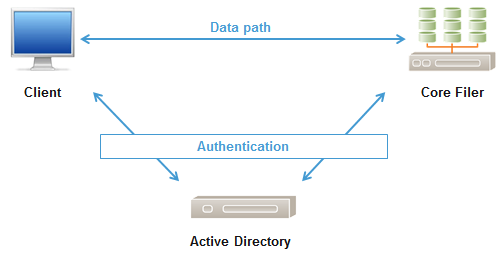 All authentication is between clients and/or core filers within the Active Directory environment. After adding the Avere Edge Filer, each SMB-enabled vserver in the Avere cluster must make ACL requests to the core filer on behalf of authenticated clients’ identities, and is enabled to do so via Kerberos configuration. This is known as delegation, and should be configured against only necessary services (SMB) on the core filer, which is known as constrained delegation. Constrained delegation gives administrators the ability to specify and enforce application trust boundaries by limiting the scope where application services on the cluster vserver can act on a user’s behalf. This flexibility to constrain a service’s authorization rights helps improve application security by reducing the opportunities for compromise by untrusted services. These are mandatory configuration items for NTFS Security Style Shares. Must be running Windows Server 2003 or later in Native Mode. Each vserver will require a machine account. An AD administrator with rights to add machine accounts, or an AD user account with sufficient permissions to add computers to the domain, is required. The machine account is placed in the Computers OU by default. Ensure this step is done during the addition of the machine accounts rather than trying to move them after creation. To use a nondefault OU, access the VServer > CIFS page for the vserver and set the Organizational Unit field. VServer IP Addresses must be added as round-robin DNS (RRDNS) entries. Each vserver has a range of IP addresses associated with it. These addresses are used for name resolution and SMB/CIFS share access. Each IP address must be added to the vserver hostname in DNS. This ensures round-robin resolution across all client-facing addresses. Refer to Configuring DNS for the Avere Cluster for more information about using RRDNS. The Avere cluster must be able to resolve the core filer DNS fully qualified domain name (FQDN). Clients must be able to resolve the vserver FQDN consistently as well. If you are operating more than one DNS environment, both environments must resolve the names. 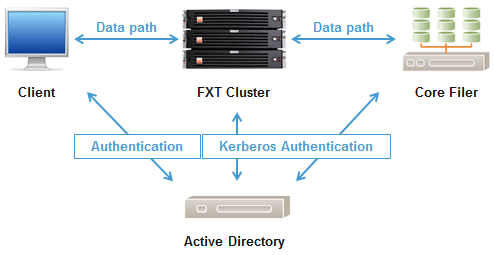 The vserver machine account must be able to request and obtain kerberos tickets for the SMB service using the core filer FQDN server name (as configured in the FXT UI) as the kerberos principal. Therefore, the core filer machine account SPN name must match the fully qualified domain name. The vserver machine and core filer machine accounts must be in the same Active Directory domain. The Avere cluster uses additional user and group attributes to process client requests. These are the UID and GID information. The attributes may be mapped to AD Users and Groups in two ways. You may configure each user/group who require access. Use ADSI Edit to modify. You may enter mappings of Windows users to UIDs and GIDs, and store that file on the FXT Cluster. These are the basic steps for setting up Active Directory to work with your Avere cluster. The Service Principal Name (SPN) allows Kerberos tickets to be obtained for the SMB service on the core filer. A Service Principal Name must be configured for the core filer’s SMB Machine Account. This SPN is required for Kerberos constrained delegation. If the SPN does not exist for SMB and the FQDN, it must be added. These steps must be performed on the Active Directory server by a user with administrative privileges. In the left-hand pane, expand Network and find the vserver machine account in the OU that it was joined to (usually “Computers”). 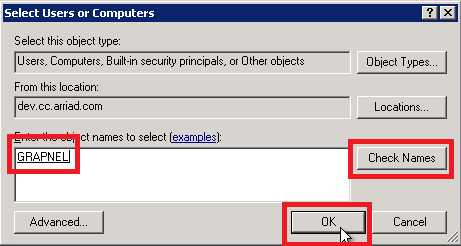 In the right-hand pane, right click on the vserver’s machine account object and select Properties. Select Trust this computer for delegation to specified services only. In the Add Services dialog, click the Users or Computers button. Type the core filer’s machine account name and click the Check Names button. Select the name of the core filer from the list and click OK. The Add Services dialog appears again. Select the “CIFS” service type for the core filer’s machine account. The Avere cluster uses specific user attributes for NFS operations. 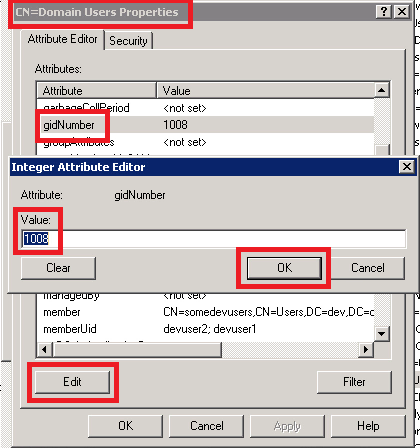 The easiest way to set the gidNumber and uidNumber attributes is to use ADSI Edit on the Active Directory server running adsiedit.msc. 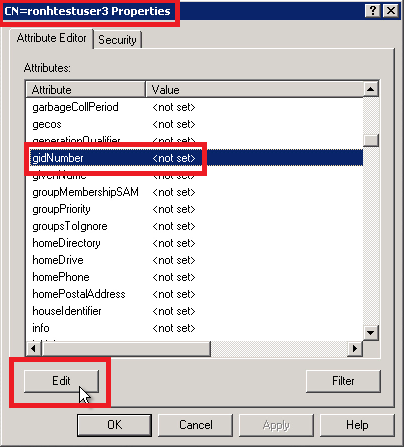 Set the user’s gidNumber attribute to match the “Domain Users” gidNumber. In ADSI Edit, right click CN=Domain Users & choose Properties. If the value is “<not set>,” we recommend setting it to a unique number between 10000 and 65000 by clicking Edit, clicking in the Value field, typing the number, and clicking OK. If the value is set, copy it. 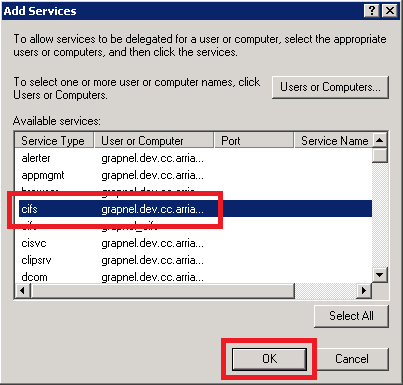 Click OK and close the Domain Users Properties dialog box. Right click the entry for the desired user and choose Properties. For the value, paste or type the gidNumber as taken from the gidNumber of “Domain Users” and then click OK.
Avere Systems recommends a number between 10000 and 65000. 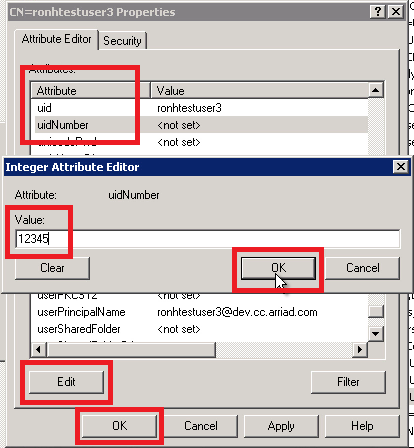 While in the ADSI Edit user properties, find and click the uidNumber attribute. Enter a unique number between 10000 and 65000. Click OK on the right. Click OK on the bottom to commit attribute changes (gidNumber and uidNumber). For SMB client access, users are authenticated by their Windows credentials but authorized based on their UNIX credentials. This is required because the Avere cluster uses NFSv3 for the datapath to the core filer. For this reason, we require that users and groups have rfc2307 attributes in order to facilitate this. Required. Value must be assigned by admin. In order to successfully evaluate the entries on a core filer Access Control List (ACL), we need to be able to map a user and group Security ID (SID) to the corresponding UNIX credential. To accomplish this, in addition to Active Directory for user authentication and SID-to-username translation, we also require a Directory Service as a source of these attributes. This can be NIS, LDAP, or a flat file, whichever is the authoritative source of these attributes in your environment. If there are multiple sources, we should use the same source that the core filer is using as it will also need to reverse translate from UNIX credential to Windows SID. If there is not an authoritative source of these attributes, a flat file can be generated to provide these values. Alternatively, these can be populated in Active Directory via ADSIEdit. Active Directory can then be configured as the Directory Service via LDAP. The LDAP Server can be in a comma-separated list of servers. The BASE DN will match the LDAP DN of the domain.